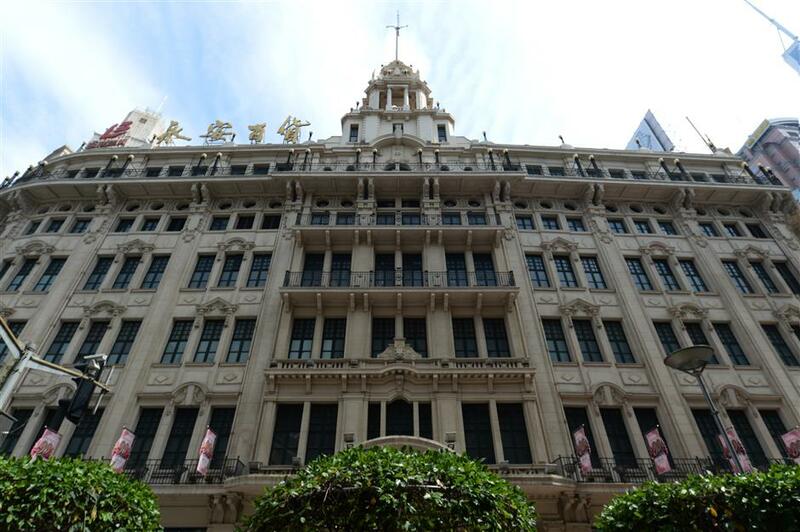 The Wing On Department Store, the second of four big Chinese department stores on Nanjing Road, overshadowed its immediate rival Sincere Co.
Wing On displays Baroque style with some Neoclassical elements. The graceful and imposing elevation was designed by Palmer & Turner in 1918. The Wing On Department Store was the second of the four big Chinese department stores on Nanjing Road — the other three being Sincere Co, Sun Sun and The Sun. The emporium not only enjoyed better business than the first one, Sincere Co, but also built the tallest building on the popular shopping street. 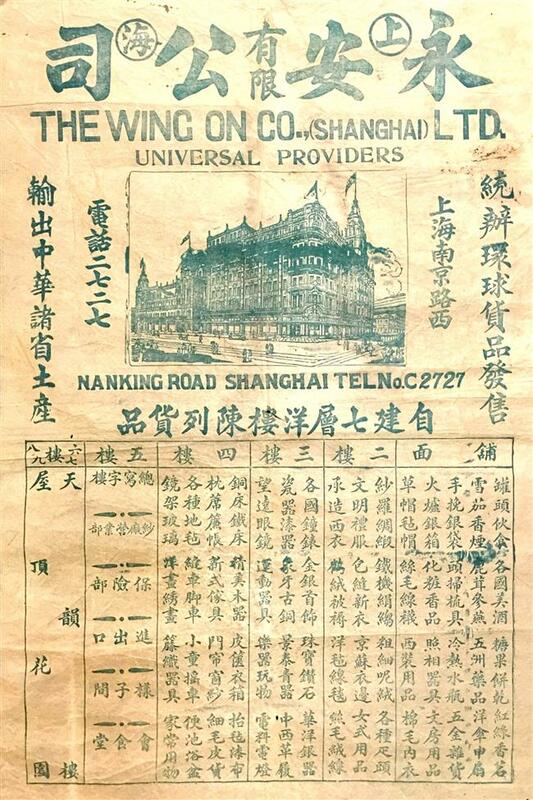 “From August 20, 1918, the Guo brothers, founders of Wing On, regularly advertised the upcoming launch of the store in local Chinese newspapers. Within 20 days since its opening on September 5, its stock for two months was sold out,” says Shanghai Archives Bureau researcher Zhang Yaojun. The success was described as “a notable example of shop building in Shanghai on an architectural scale” by The Shanghai Times in 1918. 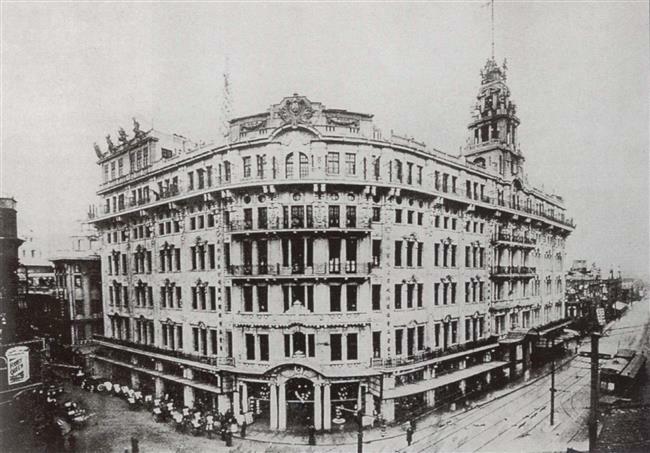 The building, consisting of a spacious department store and the Great Eastern Hotel, was designed by Palmer & Turner, a leading architectural firm which had designed nine of the 23 waterfront buildings on the Bund. 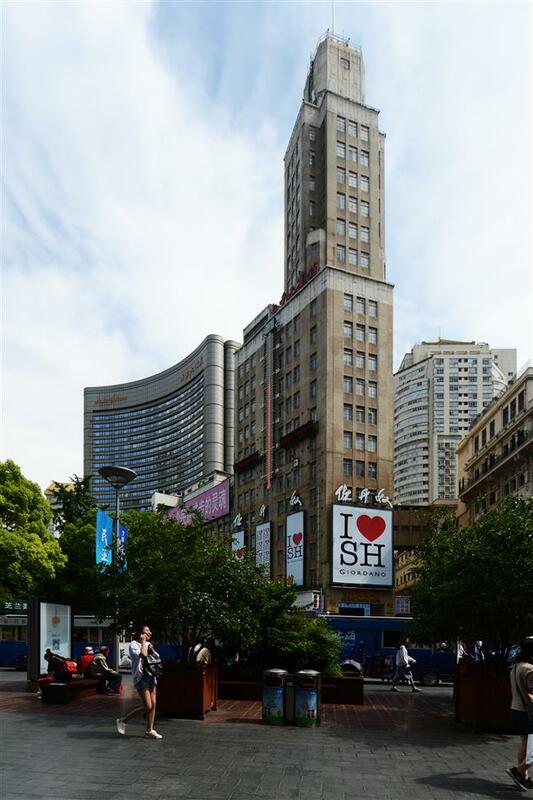 The Wing On building had its main entrance on Nanjing Road with on today’s Zhejiang, Jiujiang and Jinhua roads. “The whole block, embraced by the four roads, forms an island site in the very center of the traffic of the foreign settlement. 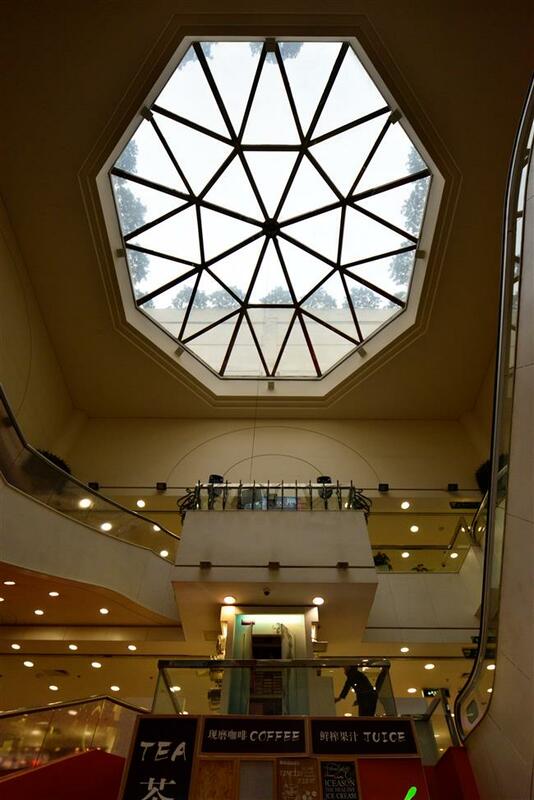 The architects have achieved a complete success, the elevations being both graceful and imposing, while at the same time complying with the commercial requirements for a large window display and spaces for advertising. These spaces have been allowed for the pilasters without in any way detracting from the general scheme of design,” The Shanghai Times reported on August 26, 1918, shortly before the store’s opening. The third and fourth floors, now housing a Chinese restaurant, have retained historical details. 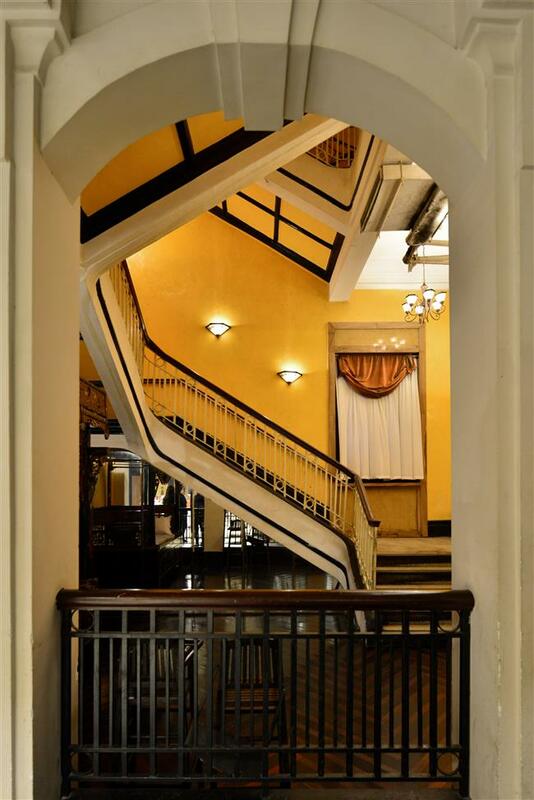 The old curved staircase linking the third and fourth floors is well preserved. Today, Yongan Department Store is renowned for goodies like clocks and watches, jewelry and cosmetics. Tongji University professor Qian Zonghao says Wing On had a more elaborate appearance than its competitor, the Sincere Co, which opened a year earlier. The report on Shanghai Sunday Times described the building in detail, which still had the main entrance marked by a series of coupled columns that formed a covered arcade. “The floor of the arcade is mosaic and the ceiling of modeled plaster covered with coffered center. The coupled columns and central feature are superposed with pilasters and crowned with a lofty tower. The show windows are of molded copper. All the sun blinds are covered and boxed in the most neat and modern group of windows for displaying articles in Shanghai,” the newspaper reported. 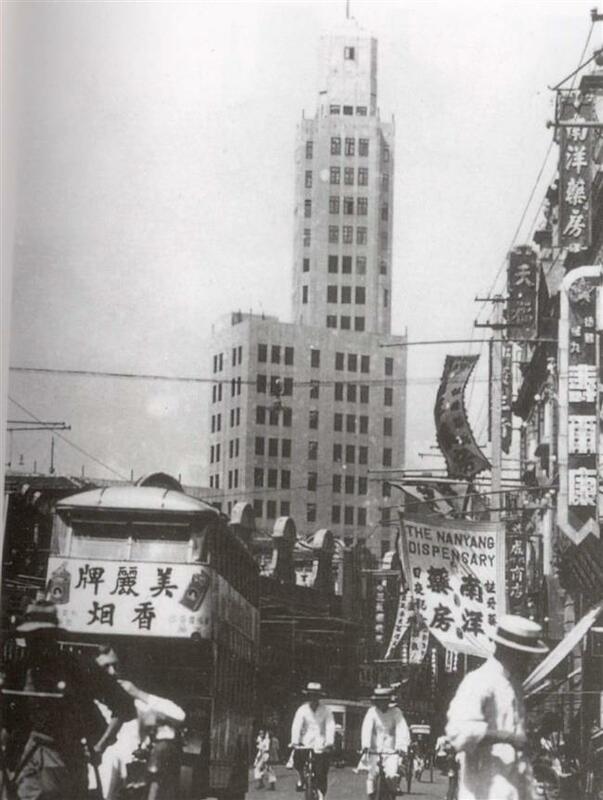 In the book “The Heart of Shanghai,” scholar Ma Xueqiang mentions that Wing On erected a new 19-floor building in 1932 on the triangle-shaped site adjacent to the 1918 premise. Designed by American architect Elliot Hazzard, the new building was a simply-cut, steel-structured skyscraper, which still stands next to the century-old Wing On Department Store. Wing On employed young, beautiful, English-speaking girls as saleswomen for the American Conklin fountain pens, which was a very successful promotion. Researcher Zhang Yaojun also attributes Wing On’s success to the store’s varied smart promotions. “All the four department stores racked their brains and worked out a rainbow of creative promotions to attract customers. 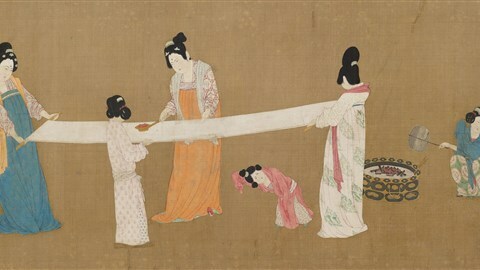 It was Wing On that made full use of women shop assistants,” Zhang says. “They employed young, beautiful English-speaking girls as saleswomen for the American Conklin fountain pens, which proved to be very successful. Visitors to Shanghai, including famous journalist Xu Zhucheng, would visit Wing On to buy fountain pens while admiring the charming ‘Miss Conklin’,” Zhang says. Wing On was operated in a flexible, innovative manner, hosting five big sales in the four seasons and one anniversary sale every year. The shop also created “accounting consumption,” similar to credit card today, for upper-class customers to buy and pay later. Wing On also invented shop window display, organized indoor fashion shows, offered delivery service and issued gift coupons to attract customers. The meaning of Wing On in Chinese, “eternal safety,” made its voucher coupons a popular gift source. Professor Qian says that both Sincere Co and Wing On had roof gardens and offered a variety of entertainment options besides shopping. It might have been a great experience to shop and relax in this Baroque building on Nanjing Road. Archives showed that the floors were made of white terrazzo with red borders, while the shop fittings and display cases were made of teak. The ground four floors sold a galaxy of globally selected products — from perfume, tooth paste, silk, jewelry to furniture and suitcases. The fourth floor was partly used as a refreshment and rest room for customers. The fifth floor had amusement rooms and tea garden illuminated with lights. The roof garden comprising summer houses and arbors had a crowning feature in the lofty tower. The entire place, when lit up, produced an effect of a fairy garden. The summit of the tower, which was the loftiest in Shanghai, offered the most extensive views of the city. 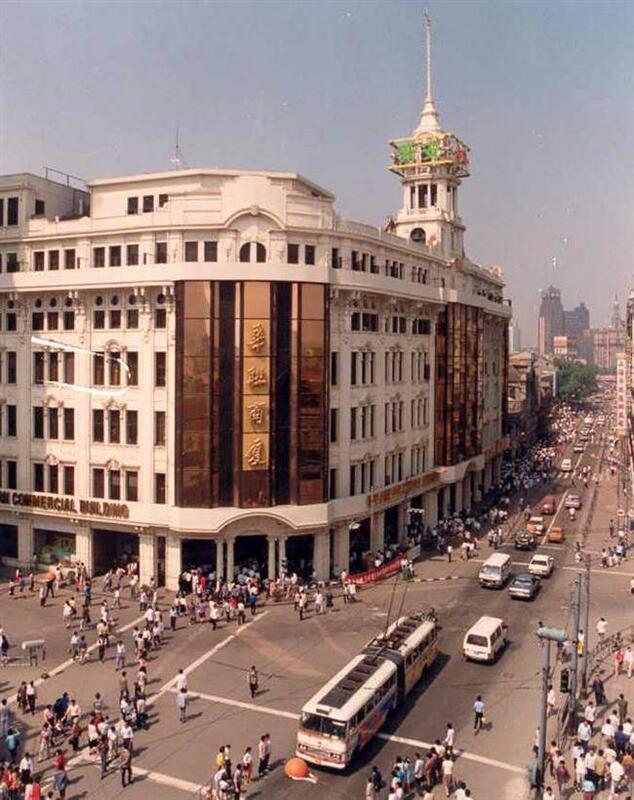 The facade of the department store has been changed in 1988 to house the Hualian Department Store. Wing On's window display was attractive. 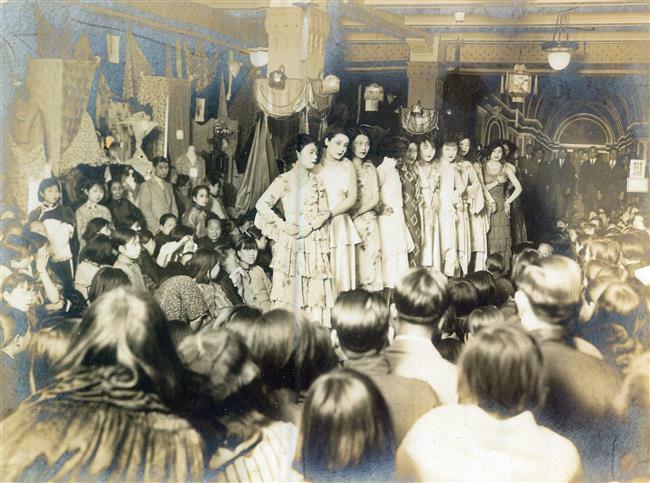 The archive photo displays a fashion show organized by Wing On Department Store. When Shanghai was liberated in May 1949, the first red flag was raised on top of Wing On building. Wing On later became the state-run Shanghai No. 10 Department Store. 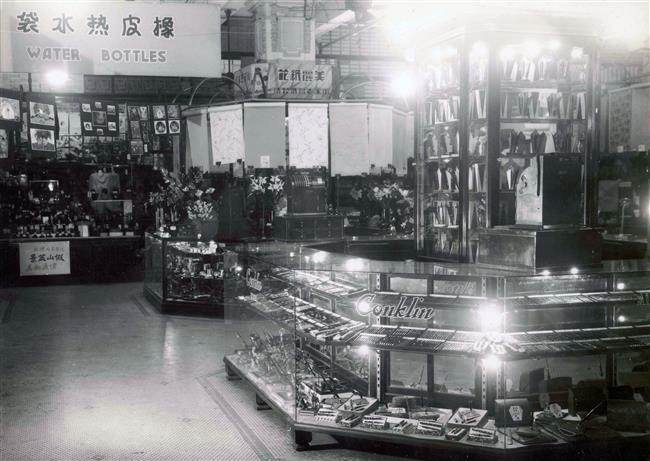 In 1988, the store reopened as Shanghai Hualian Department Store after renovation with many historical details changed. It was an era when economic development was valued more than historical preservation in China. When Shanghai architectural heritage began to attract more attention, the Baroque building was restored again in 2004. This time, glass walls that were added in 1987 were removed. The shop window was relocated to its original position and old cast iron railings, already wrapped in cement railings, were redone. When the project was completed in 2005, the emporium was renamed Yongan Department Store, almost similar to its old name (the same in Chinese but different in pinyin) and the old look of 1918. Today it is a large department store featuring 32,000 square meters over six floors and owned by the state-run Shanghai Bailian Group Co Ltd. According to Sun Jie, director of General Manager Office of the store, Wing On was renowned for goodies like clocks and watches, jewelry and cosmetics. Its customers included tourists, expatriates and local young people. “The store will celebrate its centenary next year. We intend to explore and utilize our rich historical heritage,” she says. 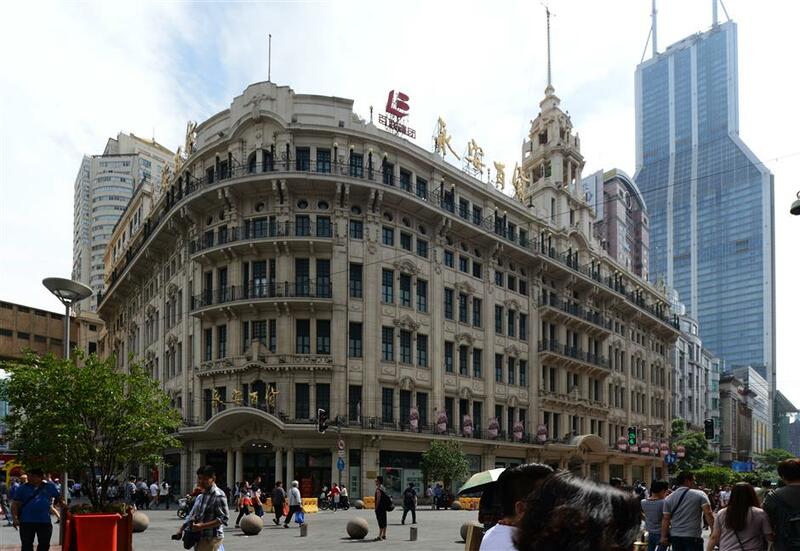 The 19-floor annex of the Wing On Department Store that was constructed at the intersection of Hubei and Zhejiang roads was widely covered by the city's English newspapers in 1932. A report in the China Press said the new building provided five floors of additional space for general sales. The fifth floor and the extensive roof spaces were intended for amusement purposes, including a cinema, a tea garden and an open-air promenade space. An important feature of the new store was a bridge that connected the store with the annex. The tower at the Nanjing Road intersection, containing the offices of managing directors, was one of the highest structures in the Far East. “The general style of architecture proposed for the exterior was the modern style with vertical lines predominating. The lower storey is of Soochow granite up to a belt course at the sills of the first floor windows. Large shop windows are provided on all fronts with green marble bases below the plate glass and between the masonry pieces. The vertical piers will probably be of light colored cast stone or imitation stone plaster with moulded spandrils of metal above and below the steel casement sash. In the upper part of the tower will be provision for an interesting system of lighting, which is intended to add a new and higher note to the Shanghai skyline,” The China Press said in a June 9, 1932 report. The new annex was built on the site of the old Chinese opera theater, Tien Zai Theater. Today the building houses the state-run Seventh Heaven Hotel. The name was derived from a former renowned restaurant in the annex. Back in the 1930s, the observation gallery on the 19th floor allowed visitors to see the entire city including the former old town, today’s Zhabei District (now part of Jing'an District) and the Pudong New Area and even the wide stretch of the Huangpu River on clear days. It’s a perfect spot (but unfortunately not open to the public) to admire the entire stretch of Nanjing Road E. all the way to the Bund, graced by a galaxy of historical buildings on both sides. The annex of Wing On now houses the Seventh Heaven Hotel. 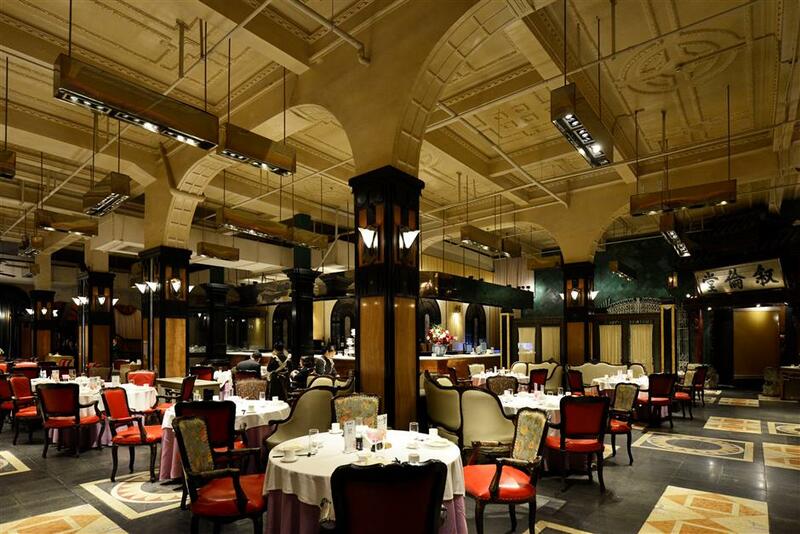 Address: 635 Nanjing Rd E.
Tips: The third and fourth floors, which house a Chinese restaurant, have retained historical details and are worth a visit.